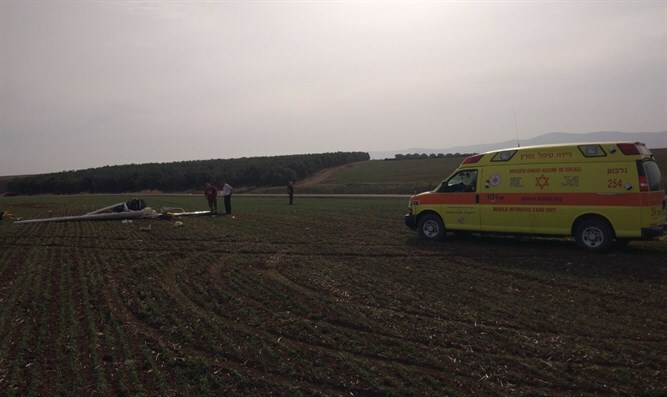 Pilot dies after 'ultralight' plane crashes in Jezreel Valley in northern Israel. The pilot of a small plane was killed Friday morning when the aircraft crashed in an open field in northern Israel. The crash occurred just before 8:45 a.m. between the towns of Kfar Yehezkel and Merhavia in the Jezreel Valley. MDA emergency first responders and local fire and rescue teams were dispatched to the scene of the crash. Authorities say the plane took off from a nearby airfield, but soon after suddenly plummeted some 700 feet, crashing into the ground. The pilot was declared dead at the scene. Police have identified the crash victim as a 72-year-old man.